The “Priv” platform of vape mods has always been a benchmark for SMOK to showcase their latest and greatest vape technology, so it comes as no surprise that their all-new I-Priv device is teeming with fancy new features. Perhaps most notable is the I-Priv’s integration with an AI Powered chipset which enables voice-control over a plethora of the I-Priv’s features. Constructed out of a durable Zinc Alloy and measuring 95mm tall, 56mm wide, and 35mm thick—SMOK designed the I-Priv device to resemble a futuristic cyborg warrior. The slender chassis of the I-Priv maintains a comfortable pocket-friendly shape that easily molds into the hand. In typical SMOK fashion, the I-Priv device utilizes a hidden side-firing bar that blends right into the side of the chassis. This sleek new firing mechanism increases the I-Priv’s ergonomics and offers nearly endless comfortable hand-held positions to vape from. The front-face of the mod is equipped with two easy-to-reach regulatory buttons which makes changing the I-Priv’s settings a breeze. But why use the +/- buttons if you can speak to the mod directly? Simple voice commands like “Hello I-Priv” or “Power off” will elicit a silly response from the onboard I-Priv Artificial Intelligence. You can also say “Power Up” or “Power Down” to increase/decrease the wattage on the device without pushing a single button. Don’t know what the best wattage is for your coil? Simply say “Best Power” and the AI will tune the I-Priv to your coil’s best wattage—followed by a reassuring “Mission Complete” response. Featuring a new and exciting TFT Screen and Dynamic User Interface, the I-Priv mod showcases a colorful display that’s customizable with up to six unique color choices to choose from. What’s more—a circular light-show wraps around the OLED display to give the I-Priv mod a very specific super-hero look and feel that might make you think that its actually got a heartbeat. For the first time in SMOK’s storied history, they’ve introduced dual 21700-battery functionality (batteries not included). Thanks to its larger battery compatibility, the lifespan of the I-Priv has dramatically improved when compared to previous products on the “Priv” platform—providing a stylish and long-lasting alternative to any of the dual-18650 battery mods on the market today. If two 21700 batteries are too heavy for you, SMOK includes an 18650 battery-adapter sleeve that can be used with two 18650 batteries to give the I-Priv a lighter dual-18650 feel. Additionally, the I-Priv is compatible with two 20700 batteries so you have nearly endless battery choices to choose from. The I-Priv mod is stocked with SMOK’s new-and-improved Temperature Control suite and offers accurate TC vaping between 200-600°F (100-315°C) with Stainless Steel, Nickel, and Titanium coils. A warrior mod deserves a tank that can put all of its skills to use, and the TFV12 Prince Sub-Ohm Tank delivers the perfect adversary for the I-Priv’s power output. Constructed out of Stainless Steel and heat-resistant Pyrex glass, the TFV12 Prince tank features a large convex glass tube that can hold up to 8mL of vape juice. Standing at 63mm tall and 24.5mm wide (28mm at the widest) the TFV12 Prince features a wide-bore 810 Cobraskin drip tip for additional style points. Providing the latest evolution of the Taste Furious Platform, the Prince tank is a top-filling tank that implements a locking top-fill swivel cap to provide fast and painless filling. Simply push the button in the top cap and swing the cap open to gain access to the large top-filling fill port. Vaping styles vary, so SMOK outfitted the Prince with a free-spinning adjustable airflow control ring that provides full-control over two massive airflow channels. Whether you prefer a more restricted mouth-to-lung vape or a deep direct-to-lung inhale, the TFV12 Prince is customizable to meet your specific vaping needs. Pre-installed inside the Prince is SMOK’s premier 0.15 ohm V12 Prince Strip atomizer head which delivers flavor like never before. Housing a large Kanthal mesh screen, the heating element covers vast cotton surface area inside the coil head to bring out the fullest flavor from your favorite e-liquids. Wicked with Pure Organic Cotton and meticulously constructed to streamline saturation, the V12 Prince Strip is rated at 40-100W to provide an unforgettable vaping experience from first vape ‘till last. 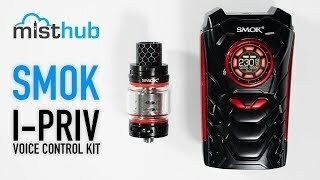 The SMOK I-Priv 230W Kit with TFV12 Prince Tank proves to us yet again that SMOK is at the cutting-edge of vape technology. If you’re looking for a visually appealing and long-lasting kit that’s got SMOK's “Priv” seal of approval, or need to have SMOK’s latest-and-greatest mod to impress all of your friends—The SMOK I-Priv 230W Kit with TFV12 Prince Tank offers a futuristic setup that will be talked about for some time to come.